First night, Puppy- proofing, Socialisation, Teething, Toilet training, Walking nicely, Fears & frights. Click on a title or scroll down to the information. Obviously the first few nights home will be new and different for your pup and they will probably be missing their siblings the most. It may take some time to sleep all night. Try not make too much of a habit of frequently getting up in the night to console your dog- play it by ear, but just be aware that you could end up making a rod for your own back should your pup grow to expect 4 am shenanigans. In our house our wires are all taped down. We use masking tape as it doesn’t leave any marks, but it will need checking every few days as it doesn’t have much longevity. Our fire has a guard, the previous owners’ cat flap and the door to the cellar stairs is bolted. Until a puppy can demonstrably be safe up and down the stairs, we use baby gates to stop our young pups from tumbling. If your dog is a bolter and you live near a road, consider baby gating off a small reception area by your front door until they have mastered their doorbell sit and wait routine. It’s best not to rely on restricting your dog and consider training your dog as soon as possible to sit and wait nicely by the front door. I’m not saying this just because I’m a trainer- picture what cold happen if you were visiting someone and their doorbell rang. If the dog didn’t know to wait nicely they could bolt out and away into danger. Make sure your garden fence and gate is secure. Be very aware of wires and leads which are transient- laptop/ phone charger/ x-box leads are not necessarily fatal (although it’s a risk not worth taking), but they are hugely expensive to replace. Socialisation: A properly socialised dog has a well rounded personality. As breeders we begin the process by inviting all our friends, neighbours, relatives (and the postman in his uniform) in to play with the pups. 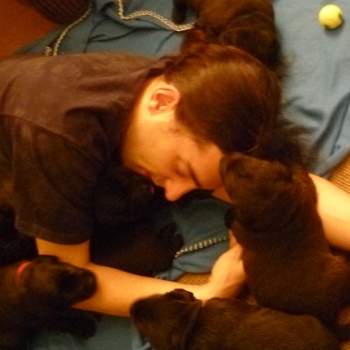 Our puppies have met lots of people of different ages and ethnicities. Working on socialisation is easy and a good opportunity to show off your new dog. Simply invite everyone you know to meet your pup. The more nice experiences they have with people they meet, interact with, be handled and hand fed by, the better. Similarly, try to introduce your pup to as many other dogs as possible. The more new and different experiences your pup has, the better armed they will be for their adult life. While a pup must be used to being sociable, they must also get used to spending time alone. This will inevitably happen as you go about your daily life- there will be times, like when you shower, when the pup is alone. 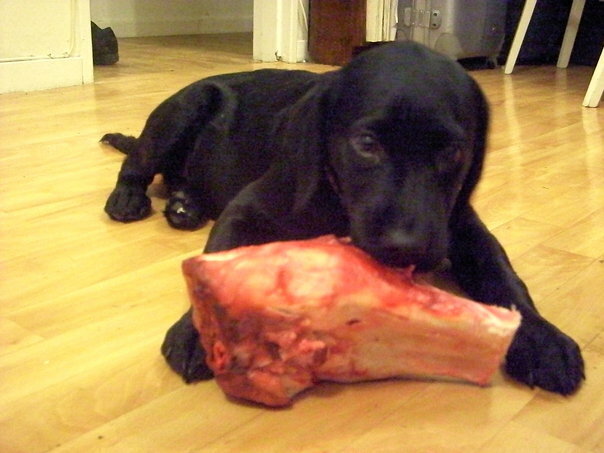 If your pup is given something to do- maybe a bone or a Kong, they should be so busy they wont be perturbed by your absence. 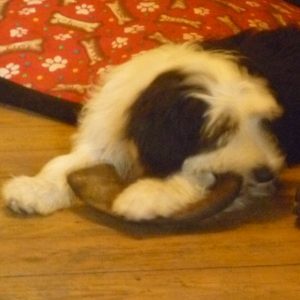 Puppies chew, it relieves the ache of teething and it is a pups’ way of discovering the world. Your pup will also get toothache as their adult teeth arrive. This can cause some chaos in the house, so be forearmed. Consider what you have on the floor. Remove anything precious (or tempting) to a higher shelf. Chewing relieves the pain in their gums so remove all potential dangers and have appropriate things readily available. Anaesthetise the gums: Check your cupboards for old flannels or thick tea towels past their prime. Dampen the clean cloths and wring them out a little, then freeze them. Gnawing on the frozen cloths will numb their mouths. Frozen carrots work equally well. 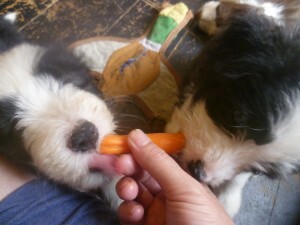 Dogs love carrots and veg is important in their diet. Kongs filled with frozen yoghurt or no-onion stock occupy and soothe. Small, real (uncooked) bones work better than the plastic ones. It’s important that everyone who interacts with the dog knows this. It is while they are teething that they need to understand the limits to their biting. All puppies bite, it’s their way of finding out new information and discovering the world- but they have to be taught that it can hurt. If they bite too hard on you, you must always let them know they have gone too far. Make a short high squeal and remove your hand. If you ham it up, act like you’re really quite sore for a couple of seconds, that will make your point obvious to your pup. This teaches that the fun things stop when they are too rough. Give them something else to chew on asap. It’s good to carry a toy about in your pocket. Have a good supply of antimicrobial cleaner and newspapers. The antimicrobial cleaner is about £15 a large bottle from the pet shop, I decant it into a spray bottle. It does a good job of cleaning the yeasts and enzymes that they can smell but we can’t, the chemicals are OK for puppies and also it will not discolour your furnishings. Place some newspaper on a (washable) mat near the outside door. 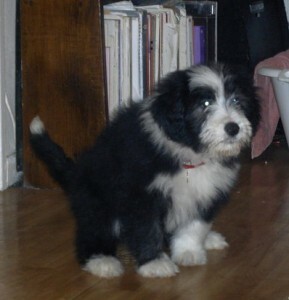 When your pup sniffs the ground this is a sign that they are ready to go to the loo, they sometimes whine a little too. Circling means pooing is imminent. Encourage the pup over to the paper. They should recognise that it is an appropriate place to go. As you clean, dispose of anything with cleaner on it, but don’t throw away all the paper soaked in the wee, place it in a carrier bag and put that just outside. Find your lead and a (separate) bag of treats, for the “outdoor” kit. If it’s cold, it will be handy to leave your shoes and a jacket nearby too. Nominate, with the family, a place in the garden where you would prefer the dog to toilet. Out of the way is better, a girl’s first morning pee can be strong enough to burn grass. Consider what word you will use to trigger for their toileting. Use whatever word you like, just make sure you don’t inadvertently repeat it in the house. We’ll use “toilet” as an example. 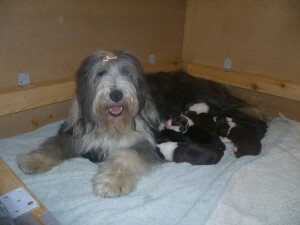 Upon the pup’s waking, a few minutes after food and then once an hour, put the lead on the dog and collect the kit. Go to your predesignated place for dog toilet in the garden and place down the smelly pee paper. This will let the pup know where to go. It may take time as they tend to get very distracted by every new and wonderful thing. Once they are performing let them know they’re doing well and teach the trigger word- praise with something like “Yes! Toilet! Good dog, toilet” but in your own words and try to be as consistent as possible. Once they have finished, treat and praise enthusiastically. Begin in the house It is worthwhile to get a puppy accustomed to the feel of their collar or harness and lead whilst in the house. Some dogs dislike the lead immensely and may need a good few treats and some chilled coaxing. Don’t forget to let them have a treat every when they get it right, they’ll be more inclined to want to continue. Remember walking nicely means the dog is walking with you- a lead is a safety line and never a training tool- jerking the lead will make an anxious or excited dog way worse. If the dog pulls on their lead, stop still, attract the dogs’ curiosity and attention vocally with a high sing song voice and wait for the lead to slacken before beginning again. Unexpectedly change direction so the dog learns they are following you, rather than doing a set routine. What sort of collar or harness should we use? We personally prefer to use a harness that goes over the front paws and supports the back and chest (Smudgey is a vision in pink- modelling her harness in the photo). If (and when) the dog pulls hard, the harness distributes their weight evenly and they stop, but should feel less jolted or jarred. Attaching the lead to a ring on the chest helps discourage pulling. If you prefer a collar, feel your dog’s neck with medium pressure- the back of their neck should feel bumpy to stroke- these are the vertebrae. Measure two bumps and buy a collar that is wider than that, so they won’t hurt their necks when they tug. For the perfect fit- if you can comfortably put two fingers inside the collar then it won’t be too loose or tight. Don’t forget to check this regularly if your dog is growing quickly. Use what you’ve learned in the house when venturing outside. There are many more distractions and walking to heel nicely somewhat goes out of a pup’s mind. An exciting, playful owner who has remembered the treats will have much more success at walking to heel and recall. Adolescent pups sometimes are startled by peculiar things, from brightly coloured plastic bags blowing about in the wind, to an old boot sitting in the road. Hackles come up, they woof and stare. It is at this point that they may become shy or nervy. It is frequently due to a growth spurt and subsequent temporary dip in calcium levels. Distract them, then go to the butchers and get a bone. 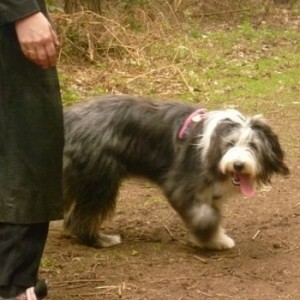 Info written by Susan Lyall MA CANTAB of Affinity, Dog Training, Northampton, Northamptonshire.